Graduation is indeed an event to celebrate and you can easily express your happiness with these custom 4x7 picture frame square corner graduation announcement save the date magnets – 25 MIL. This magnet offers large space for expressing your information, emotions, personal symbols or anything you wish. Stay assured that you are going to be remembered by your loved ones every day because this magnet will be affixed on dearest places such as refrigerator doors or office cabinets. This magnet also strikes emotional chords within onlookers and helps them to strengthen relations. 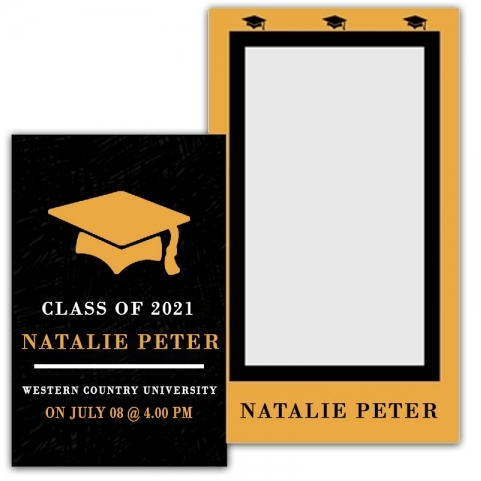 Request a quote to know wholesale discounts for these personalized 4x7 picture frame square corner graduation announcement save the date magnets – 25 MIL.